I don't know about you but I am sooo over Winter And the new Barielle Gentle Breeze Collection is seriously feeding my Spring Fever. And I don't mind, one little bit. Bring on balmy days and fresh, green buds and birds waking me up with their songs. Pink Parasol is a cool, strawberry pink crelly. While not unusual in any way, it is a pretty, sweet pink that would be flattering to many skin tones. This swatch is two coats, three on my ring and pinkie for ridges. Under the Sea is a slightly stormy teal crelly with a delicate blue shimmer. This is so pretty! As nice as it is in my photograph, gentle reader, you have to get this one on your nails to truly appreciate just how lovely this polish truly is. This swatch is three thin coats. Grey Sky. My favorite kind of sky. I am one of those weirdos who adores low, dark clouds, slashing rain, whipping winds... I glory in the powerful thunderstorms that we get in this region in the Summer and I get bummed when, after a great storm, the clouds break, the skies clear and the sun shines, once again. This delicate silvery grey shimmer reminds me of brushed stainless steel, it is very chic and wearable. This swatch is two coats. Poor Champagne Bubbles. This creamy, slightly dusty orange crelly is just the tone that wreaks havoc with my skin tone. I had to tweak the heck out of this photograph (within my limited abilities and software available to me) to get my skin looking even somewhat normal and not wreck the swatch, completely. Seriously, I have no business wearing a beautiful shade like this! If it does flatter you, tho grab this baby. It's one of those fun but appropriate anywhere kind of polishes that can go from work to play, effortlessly. This is three thin coats, four on my ridgy ring and pinkie nails. And finally we have my absolute favorite of this lineup: Heaven Sent is an aquamarine creme. That perfect Spring all over your nails blue. This swatch is two coats. 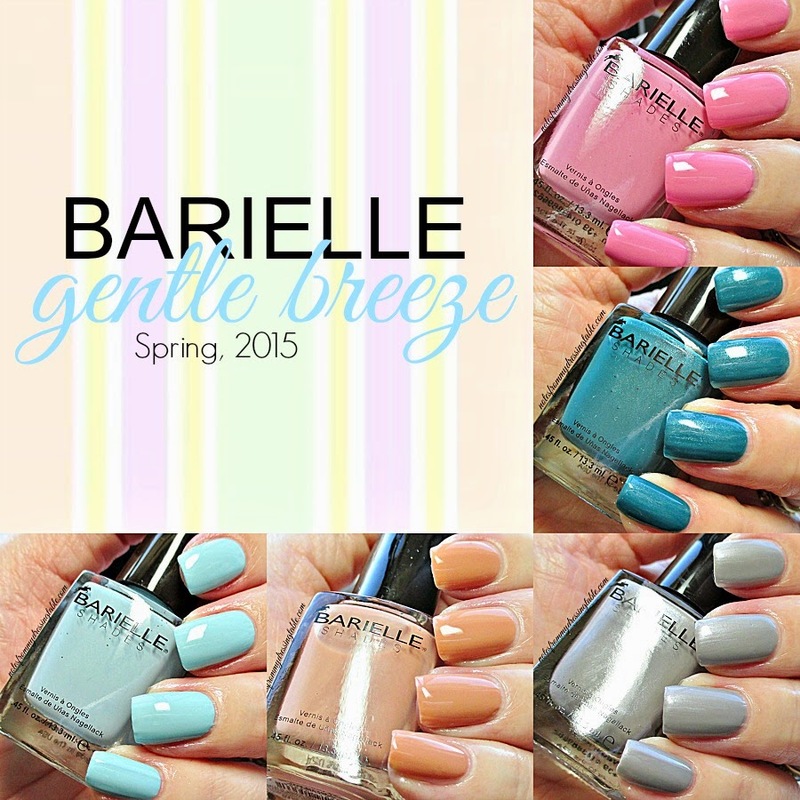 Overall, the Barielle Gentle Breeze Collection for Spring, 2015 is beautifully formulated. The crelly polishes are all smooth, silky and biddable. They all apply easily and gave me no trouble with streaking, running, pooling or bubbling. Dry time on all of these polishes, especially with Seche Vite is about average. The one true creme in the collection, Heaven Sent was actually a little devilish. Application was a bit trickier... I had to be careful not to over work this one or it would pull bald spots, it was pretty streaky on the first coat. By the second, tho I had the hang of handling it and it was perfectly smooth and opaque. Pastel cremes are, by nature tricky. This one is no exception but the beautiful colour is worth a little effort. The Barielle Gentle Breeze Collection is $25.00 for five polishes and is available on their website. You can also buy the polishes, individually for $8.00 each. Barielle Nail Color is available on their website and in various retailers. Visit Barielle on Facebook to keep up with the latest new collections, treatments and great deals and specials. Follow on Twitter and Instagram. Do you see anything you like, here? Any beautiful shades you may be picking up? Tell me what you think. I need your nails in my life. There nice and so perfect for Spring! Aw. You are so sweet. You probably could wear it. It only looks good on me in the pic because I played with the editing. In person, this shade and my skin... It wasn't pretty. Not the polish's fault. It's just a tone thing. Hee! Hee! These are so soft and pretty! They have me ready for the new season, for sure! Under The Sea is lovely! Heaven Sent is a must have for me! Heaven Sent is so pretty, it's like a Tiffany blue! Under the Sea really doesn't look like anything that I've seen before. Which means...I need it! I really like Heaven Sent! What a perfect spring collection! You do. On your nails, now! They are Spring, aren't they? It's even better in person and it would look so good on your nails. It's even better on the nails. You should get it. For me, too. I love that colour! I love your photos for this! Wow! Beautiful photos! That gray shade is gorgeous... I'm not a gray person for nails, but I can't stop looking at it. My fave is definitely heaven sent! Love this collection! It's so pretty! Loving these shades, especially Under the Sea, they all look great on you! Thank you! Isn't it funny how sometimes you are just struck by a colour you don't normally like? I'm that way about brown... But I have one brown polish that I absolutely love. It looks like dark chocolate on my nails and it is absolutely delicious. Thank you so much! I love Under the Sea! It is so special. Isn't it gorgeous? Such a perfect blue! I'm so ready for spring too! These colors are perfect to get us in the spirit. I actually love every one of these shades :). Winter can end, now. LOL They are all pretty, aren't they? Heaven Sent is so popular! Everyone is loving that one.